A few weeks ago I hosted a cookout in celebration of SensitiveHusband’s birthday. We had a really nice time visiting with family and friends. I ordered a few side dishes from our local grocery store so that I didn’t have to feel like I was spending my whole day in the kitchen. The menu turned out great! For appetizers there were cooked shrimp, cheese and crackers, and watermelon. Dinner included fruit salad, Greek salad, pasta salad, hamburgers, hot dogs, and veggie burgers. The meal was topped off with MIL bringing the flourless chocolate cake. While most of our guests that evening were carnivores, a couple of guests were egg-eating vegetarians. Since I don’t typically purchase veggie burgers at the store, my trip down that aisle left me a bit dazed and confused. There are a lot of commercial veggie burger options available, but which ones taste the best? I decided to solve the matter by making my own. 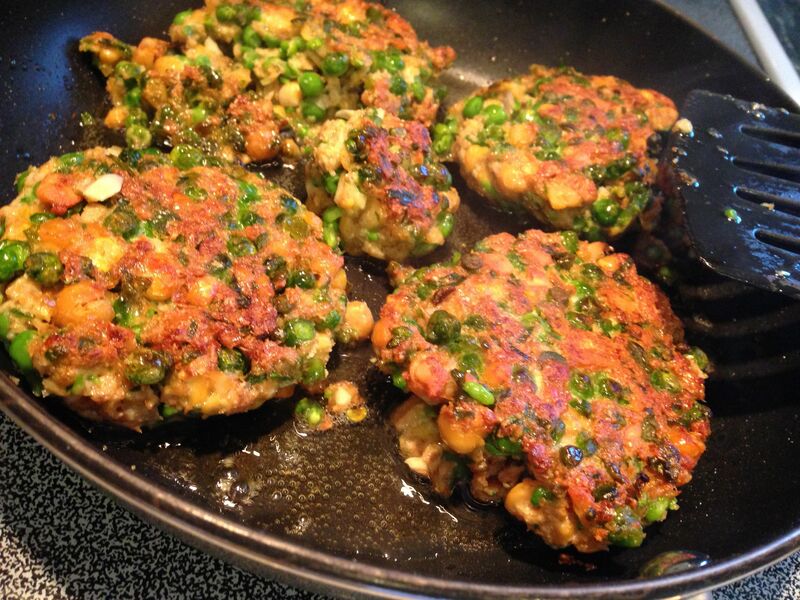 I was inspired by a recipe in Martha Stewart’s May 2015 Living magazine for Green-Pea Burgers with Harissa Mayo. I didn’t make the mayo because I figured that our friends would enjoy the tomato, lettuce, cucumber and condiments available for all the burgers. I swapped out the onion for garlic, and used wheat germ instead of breadcrumbs so that my creation would also be onion and yeast free. I added an extra egg white to get the consistency I wanted when forming the burgers. You may want to add a little olive oil also to east the burger making process. They are delicate to cook but flipped fairly easily in a non-stick skillet with a flexible spatula. The burgers are quite tasty and were well-received by all of the guests at our picnic. These will definitely be part of our cooking repertoire from now on. Coarsely chop the peas and chickpeas either with a knife on a cutting board or using a food processor. Transfer to a bowl and stir in garlic, parsley, eggs, and wheat germ. Season with salt. Form into 4 patties, each about 3/4 inch thick. Heat oil in a large nonstick skillet over medium. Cook burgers until golden brown, about 4 minutes on each side. Serve with any condiments or toppings you choose. 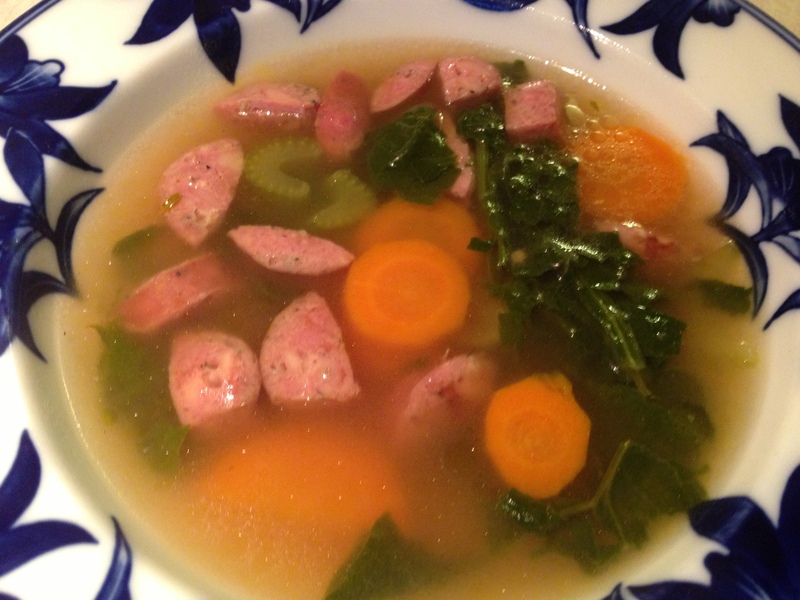 Spinach Sausage Soup That is Full of Flavor and Free From Gluten, Sugar and Yeast! I have been really pleased lately because the weather has been delightful. Not only have I been able to enjoy the outdoors, my CSA farm share extended its season for an additional five weeks! I am still receiving fresh produce that is inspiring me to try new recipes. Last weekend I had a bounty of farm fresh carrots, garlic, parsley, thyme and spinach. I also had a nice chicken sausage sitting in the fridge that had not yet been spoken for. I decided to whip up a spinach and sausage soup, which seemed like a nice accompaniment to the cool temperatures in the evenings. If you don’t have fresh herbs on hand, the soup will do well with the dried versions – just use smaller quantities. All of the ingredients can be purchased either at the grocery store or farm stand. My sausage of choice is Aidell’s Roasted Garlic and Gruyere because it does not contain anything that I am sensitive to. Their web site has a useful list of their products with allergen information so you can choose a sausage that will work with your dietary needs. And if you need a yeast/gluten/sugar/onion free broth, Pacific Organic Mushroom Broth is a great option. The soup is full of flavor and is great as an appetizer or entree. I hope that you find this soup to be delicious too. Heat a large saucepan on medium high. Add olive oil and garlic to pan, and allow the garlic to start sizzling. Add the carrots, celery, and sausage to the pan, and allow to brown, stirring occasionally, about 5-10 minutes. Add broth and water to the pan, turn up the heat to high, and bring to a boil. While heating up, add the pepper, parsley and thyme. Once the soup has reached a boil, add the spinach and reduce the heat to a simmer. Allow to simmer for at least 30 minutes; then your soup is ready to enjoy. I am sharing my recipe with Simply Sugar and Gluten Free. Happy Summer everyone! The days are long and the temperatures are heating up. Speaking of summer, have you participated in my latest two-click poll? I am interested in your opinions regarding your favorite summertime foods. I plan to create a new recipe based on the food that receives the most votes, so thank you for your participation! Just click this link or visit my home page. My CSA farm share continues to surprise me. Last week my box was filled with an assortment of green leafy vegetables including bok choy (pictured in the front), collard greens (on the right), and spinach (on the left). The bok choy, also referred to as Chinese Cabbage, has thick, white, edible stems. 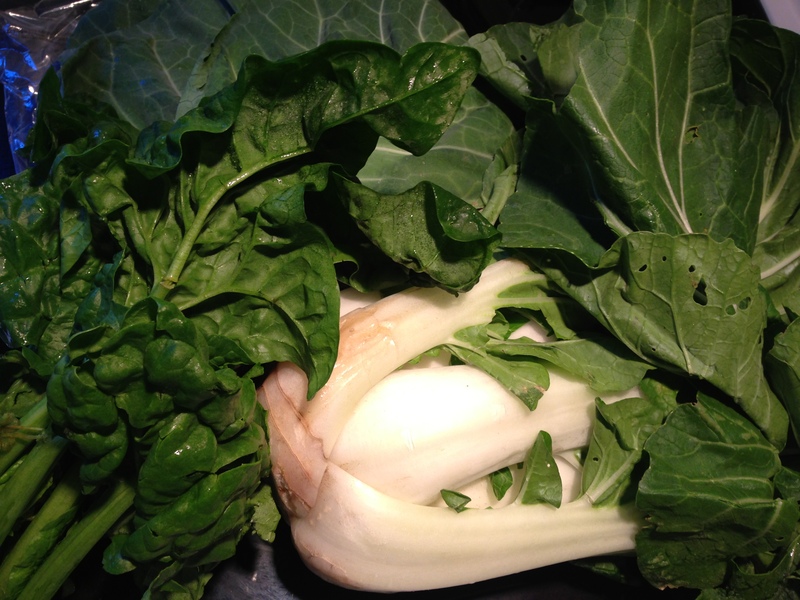 Collard greens, like bok choy, are part of the cabbage family, with wide, green stems that resemble pretty fans. Native to central and southwestern Asia, spinach is an edible flowering plant in the amaranth family with leaves that are smaller than the others already mentioned. They are all delicious but I prefer to eat them cooked because they have a sweeter flavor and are easier to chew and digest. Since I had an abundance of leafy greens, I decided to try a vegetable tart. 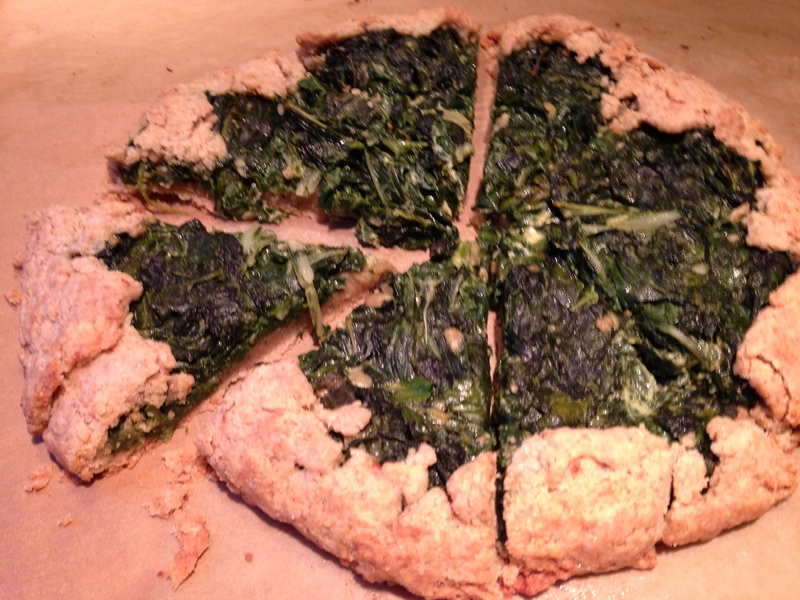 I was inspired by Leah Eskin’s recipe for Chard Tart that I found in a newspaper. I had never made a tart before, and I must warn you, the recipe is a bit more involved then one of my typical recipes. There are a number of steps and the total process takes awhile because you have to allow for chilling time (for your crust, as well as yourself). 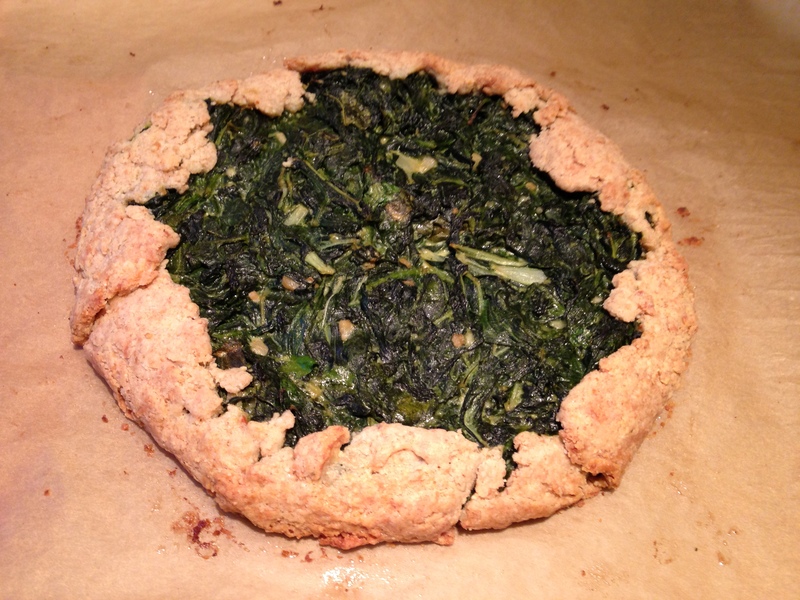 The recipe calls for rolling out the pastry dough, which I would rephrase to “pound with fists until the dough kind of resembles a lopsided circle.” However, the shape of your dough only lends itself to the rustic nature of this tart. The flavor is delicious, and the crust was quite crispy. I liked the comfortable look of the tart, which can be eaten as a vegetable alongside a main entree, or as the main highlight of a meal. The tart can be easily frozen, although SensitiveHusband and I had no trouble polishing this off within a few days. If you find yourself with an afternoon without a set schedule and an abundance of green vegetables, give this recipe a try. Shred: Fold each washed leafy vegetable in half along its center rib. Trim away ribs. Roll up leaves and slice thinly crosswise. Wilt: Heat olive oil in a wide skillet over medium heat. Add garlic, salt and pepper and cook, stirring, until lightly colored, about 2 minutes. Toss in green vegetables. Cook, stirring, until wilted and liquid has evaporated, about 5 minutes. Take off the heat and allow to cool slightly, about 5 minutes. Stir in egg, cheese and herbs. Spread vegetables onto pastry in an 8-inch circle. Fold edges of pastry up and over, forming a casual tart. Bake: Slide pan into a 400-degree oven, and bake until pastry turns golden, about 35 minutes. Serves 8. Pastry: Mix well: 1 cup flour, 1/4 cup almond flour, 1 teaspoon maple syrup, 1/4 teaspoon fine salt and a few grinds of pepper. Drop in 9 tablespoons cold unsalted butter, cut into slices. Cut butter into flour mixture with two forks until lumps range in size from cornflakes to crumbs. Drizzle in up to 5 tablespoons cold water, folding with a flexible spatula or fork, until pastry comes together. Pat into a thick disk or ball. Wrap in waxed paper and chill at least 1 hour. The alternate title for this blog post is: Sending My Condolences to the 30-Year-Old Blender. A few weeks ago my mother-in-law called me to say that her trusty decades-old blender had stopped working that morning. It just conked out while making a smoothie! I offered my condolences because the blender had been a staple in MIL and FIL’s kitchen for some time. However, as MIL noted, all was not lost, because the Vitamix blender that she had her eye on had just gone on sale! She wanted to purchase the new appliance but knew that she would be starting a vacation soon after, and did not want her shiny, new blender to be sitting on her front step. So being the generous DIL that I am, I offered to have it shipped to my house, where I could take it in. And I offered to go one step further – I would test out the new Vitamix. After considerable laughing on both sides of the phone, we decided to venture forth with this plan. The Vitamix arrived on my doorstep on a Thursday evening. I opened the box to reveal the machine that had a very pretty cinnamon hue. I spent most of that weekend just reading the manual and all of the cookbooks that came with it. There was quite a bit of reading material! By Sunday afternoon I was ready to try my first creation – Turnip Soup! I enjoy roasted turnips and had never tried making a soup that required blending. Now was the time! I peeled and cubed the turnip before roasting so the vegetable became very tender. I chopped the potatoes and apples yet left the skins on because I figured the Vitamix would blend all those pieces well, which it did. If your blender is not as powerful you may want to peel those items. Turning a Vitamix blender on for the first time is quite an experience. Please note that any lightweight items (such as napkins, nuts, etc.) on any nearby counterspace will move as a result of the wind current created. The hum is distinctive, kind of like an airplane taking off but not as loud. That Vitamix had the food blended in no time! I had to blend a few batches, which got to be kind of a messy experience, but the blender is really easy to clean. 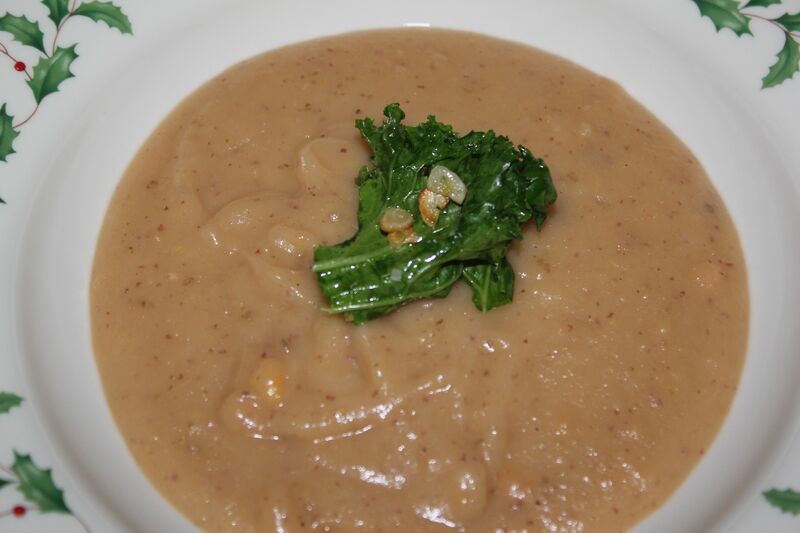 Below are the steps I took to a very tasty blended soup with roasted turnip, apple and potato. I hope that you like the soup as much as SensitiveHusband and I did. Cut turnips into (roughly) same-sized pieces, about ½ inch to 1 inch thick, depending on diameter. Don’t worry about precision because the soup is going to be blended anyway. Place turnip pieces in a 9×13 glass pan lined with parchment paper. Toss with olive oil, salt and pepper, and then bake at 375 degrees for 45 minutes. Let cool before blending. Peel the potato and cut it into pieces about the same size as the turnip. Add the garlic and cook for 2-3 minutes. Add the broth, water and potato. Increase the heat to medium-high and bring to a boil. Then lower the heat and simmer for 15 minutes or until the potatoes are soft enough that they can easily be pierced with a knife. Remove from heat and purée the potato and liquid in a blender along with turnip, working in batches if necessary. Tip: Use care when processing hot items in a blender as the hot steam can sometimes blow the blender lid off. Start on a slow speed with the lid slightly ajar to vent any steam, then seal the lid and increase the blending speed. Season to taste with salt and pepper. If desired, add a garnish such as sauteed garlic and kale. I have really been enjoying soup lately. With the cold temperatures outside and frequent snowfall, it’s nice to know that a fresh, hot cup of soup can be ready in minutes. Soup is a great way to incorporate a variety of vegetables into a meal, and by adding lentils it is hearty enough for an appetizer or a whole meal. An article in the Proceedings of the National Academy of Sciences late last year finds evidence that humans evolved with larger brains because they cooked their food, which allowed more energy and nutrients to be absorbed in their bodies. It sounds like eating homemade soup is both tasty and a smart thing to do. 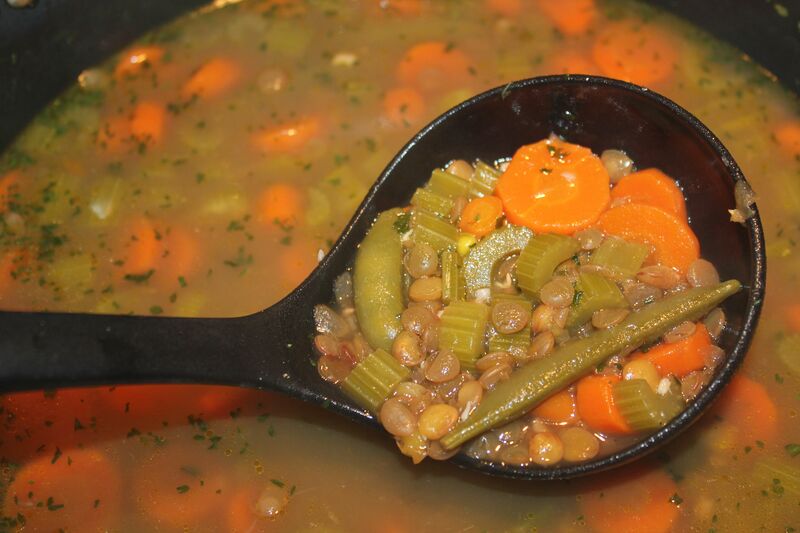 I wanted to try making a lentil soup, since you do not have to spend time soaking or peeling lentils – just rinse and add to the soup. This is a time saver over dried beans. I found an online recipe for Chunky Vegetable-Lentil Soup from Better Homes and Gardens, and made a few modifications to remove the onion and boost the number of veggies. I added peapods to my soup, and in my next batch I added spinach, which both worked well and added to the flavor. This soup tastes even better on the second day once the vegetables have a chance to meld. When reheating, you may choose to add another cup of water because the lentils, over time, will soak up moisture and the soup will thicken. I hope you enjoy this delicious soup. In a 4-quart saucepan, heat oil over medium heat. Add garlic; cook for 2 to 3 minutes until garlic is tender, stirring occasionally. Stir in lentils; cook and stir 1 minute. Add mushrooms, carrots, celery, any other favorite vegetable, water, vegetable broth, salt and pepper. Bring to boiling. Reduce heat and simmer, covered, about 25 minutes or until lentils are tender. Garlic Shrimp with Quinoa is a Gluten Free Treat! A few months ago, I shared a delicious recipe for garlic shrimp with pasta that was created by my MIL and FIL. SensitiveHusband and I just love this meal because it is fairly quick and easy to prepare, especially if we work on it together. 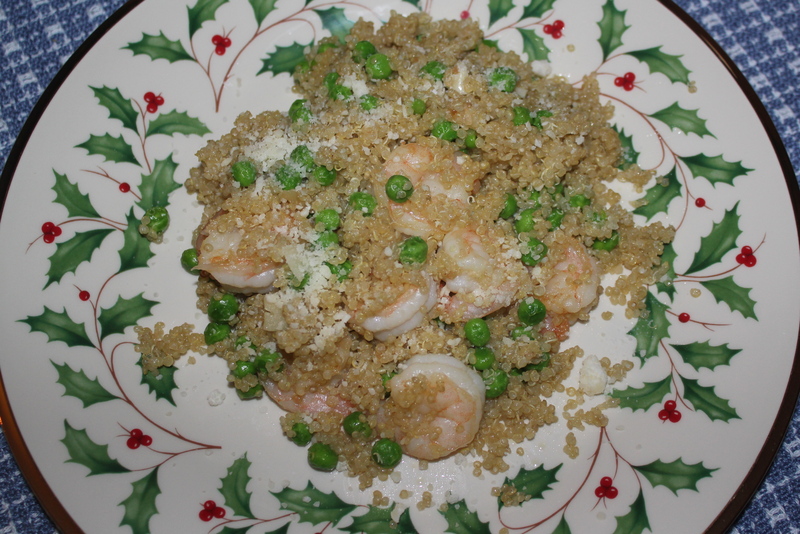 However, we recently tried a variation of this dish that was also quite good – instead of tossing the shrimp and peas with pasta, we used quinoa. Keen-what? Quinoa (pronounced KEEN-wah) is an amino acid-rich seed that has a slightly crunchy texture and nutty flavor when cooked. Most commonly considered a grain, quinoa is actually a relative of leafy green vegetables. Click on this web site from the George Mateljan Foundation for a helpful chart that shows the daily percentages of magnesium, folate and other nutrients in quinoa. It is also gluten free, which is a welcome benefit to many people’s diets. In order to make this dinner, follow the instructions for MIL and FIL’s Garlic and Shrimp Pasta. Just cook up some quinoa instead of the pasta and toss with the shrimp and garlic at the end to serve. Enjoy this dinner! I am sharing this recipe with Simply Sugar and Gluten Free, Miz Helen’s Country Cottage and Food Trip Friday. 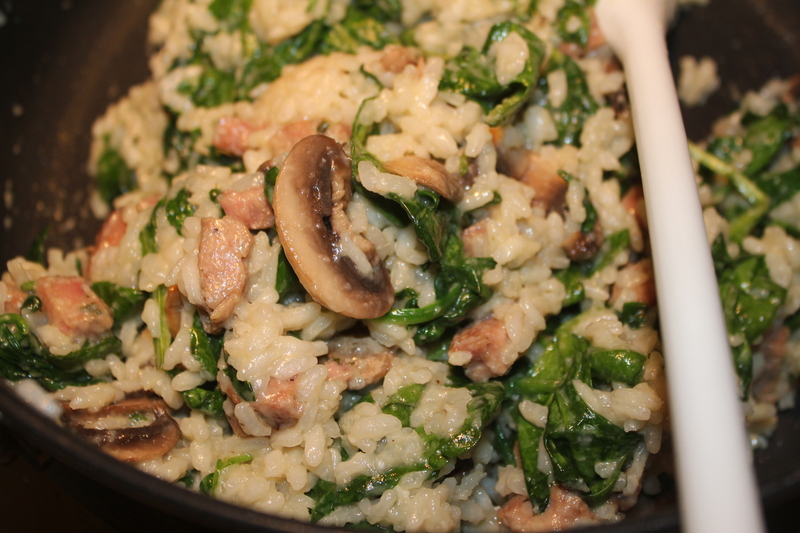 This past Friday night, I boldly stirred something I had never stirred before…risotto. Risotto is an Italian rice specialty made by stirring hot stock into a sautéed rice mixture (thanks, Epicurious, for the definition). The slow addition of hot stock allows the rice to release starch, which gives risotto a creamy consistency. (1) Prepare all of the ingredients ahead of time. This is because once you start stirring, you will find it hard to stop. Fortunately, I prepped fairly well ahead of time so my mushrooms were sliced, garlic was minced, sausage was diced, and other ingredients were accessible. The spinach however, remained in the bag, unwashed. As I stood stirring at the stovetop, watching with amazement as the rice slowly became a creamy risotto, it became clear that the leafy green vegetable was not going to wash itself. I felt relief when SensitiveHusband walked in the door, home from work. I was so happy that he was home so we could chat, enjoy a good meal, and he could wash the spinach. (2) When the recipe calls for “constant stirring,” it is not kidding. Pull up a chair, hold a good book in one hand, and keep stirring with the other hand. I was able to take mini-breaks, but once you wipe the sweat from your brow, return to stirring. I found a few other good tips from Susan Russo for NPR, but as long as you follow this recipe you should not have any trouble getting the correct result. 4. Sacramento Valley of California. The USDA’s rice outlook from February 10, 2012 notes that the 2011-12 global rice production forecast was raised 1.3 million tons to 462.7 million tons, which is the largest crop on record. It looks like Italy’s arborio rice crop is expected to be a good one this year, so enjoy your risotto! 1. Bring broth and 1 cup water to a simmer in a small saucepan (do not boil); keep warm over low heat. 2. Heat a Dutch oven over medium-high heat. Add oil; swirl to coat. Add salt and mushrooms to pan; cook for 8 minutes or until browned, stirring occasionally. Remove mushrooms from pan, and set aside. 3. Add sausage to pan, and cook for 3 minutes or until browned. Add garlic; cook 1 minute, stirring constantly. Reduce heat to medium. Add rice; cook for 1 minute, stirring constantly. Stir in 1/3 cup water, and cook until liquid is nearly absorbed, scraping pan to loosen browned bits. 4. Stir in 1 cup broth mixture; cook for 2 minutes or until liquid is nearly absorbed, stirring constantly. Add remaining broth mixture, 1/2 cup at a time, stirring constantly until each portion of broth mixture is absorbed before adding the next (about 30 minutes total). Remove pan from heat. Add mushrooms and spinach; stir until spinach wilts. Top evenly with cheese. Serve and enjoy immediately. I am sharing this recipe with Simply Sugar and Gluten Free, Miz Helen’s Country Cottage, Food Trip Friday, Cybele Pascal Allergen-Free Cuisine and Simple Living with Diane Balch. The grocery store recently had grass-fed steak tips on sale, and they looked quite fresh so I picked some up for dinner. When I got home I searched the Internet for some inspiration and found a recipe for steak with mushroom sauce. I had some frozen beef broth that I had made (yeast and sugar free) and made a few other changes to remove the onion. SensitiveHusband and I were really happy with the result. It was great enjoying a homemade sauce with our steak! 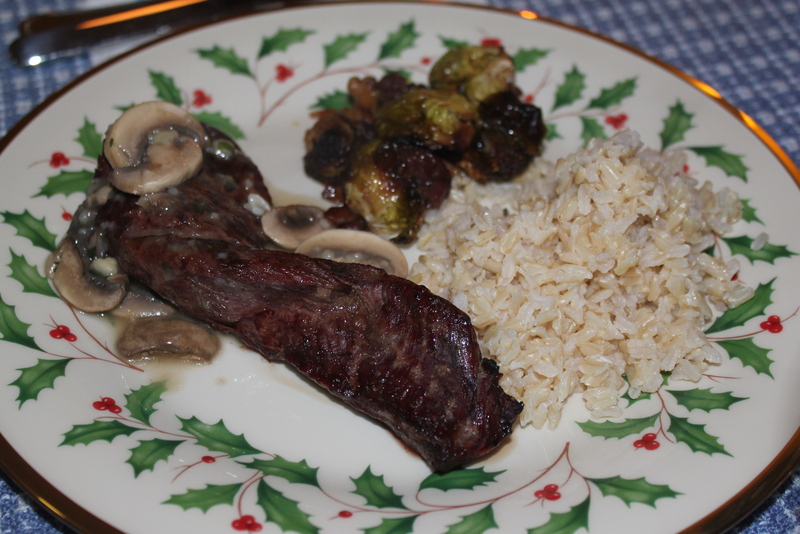 Our sides included brown rice and roasted Brussels sprouts with grapes. We had a great meal. Melt butter in a large skillet over medium-high heat. Add mushrooms and cook about 5 minutes. Deglaze the pan with half of the beef broth. Increase heat and bring to a boil. Allow the mixture to boil until it has reduced by 1/3. Meanwhile, grill the sirloin tips to desired doneness. Season with salt and pepper if desired. When the sauce is reduced, stir in the other half of beef broth, and garlic. Return to a boil, and continue to cook for another 5 to 10 minutes. Sauce will be thin like au jus. Whisk in flour, and cook until the sauce is the desired thickness. Taste and adjust seasoning if necessary. Serve tips with mushroom sauce. This recipe is being shared with Simply Sugar and Gluten Free, Food Trip Friday, Miz Helen’s Country Cottage and Cybele Pascal Allergen-Free Cuisine. I like serving Cornish game hens when I am looking for something festive that does not require roasting an entire chicken or turkey. They don’t take too long to prepare and are really tasty, therefore good for celebration meals as well as any dinner. 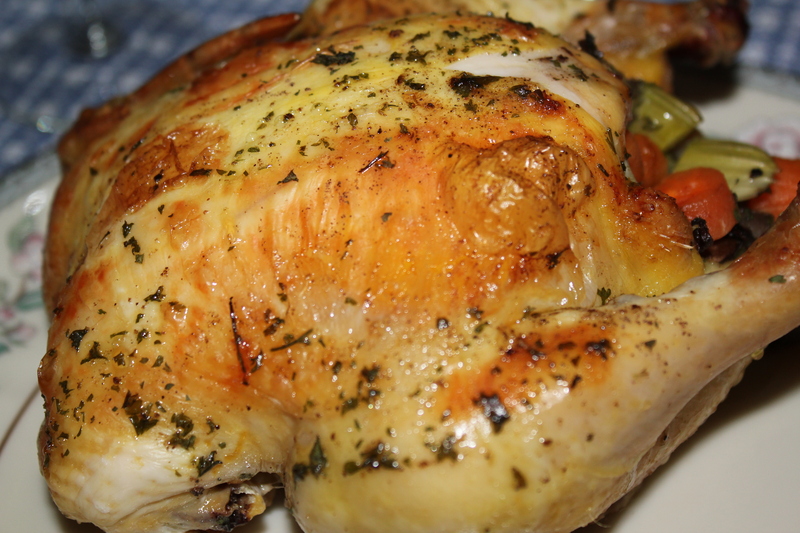 Cornish game hens have a lot of nutrients and are good sources of some B vitamins, phosphorous, zinc and riboflavin, among others. SensitiveHusband and I prepared these on New Year’s Eve, diverging from the original recipe by reducing the butter and swapping the onion with a carrot. We also used thyme instead of oregano. Serve with any of your favorite starch and vegetable – we had couscous and roasted brussels sprouts. –Preheat oven to 325 degrees F.
–In a small bowl combine 1/4 cup melted butter, celery, carrot, mushrooms, garlic, basil, thyme and parsley. –Season hens inside and out with salt and pepper to taste, then stuff with equal amounts butter/vegetable mixture. Place stuffed birds in a 9×13 inch baking dish, breast side up. Drizzle with 1/4 cup melted butter and sprinkle with parsley. –Cover dish with aluminum foil and bake in the preheated oven for 1 1/2 hours. Remove cover and brown at 500 degrees F.
I am sharing my recipe with Simply Sugar and Gluten Free and Food Trip Friday. And now…the remaining recipes from our holiday menu! These two dishes are great to bring to others’ houses. I know this first-hand because these vegetables were brought to our house and they worked so well with the rest of the meal. They are easy to prepare too! 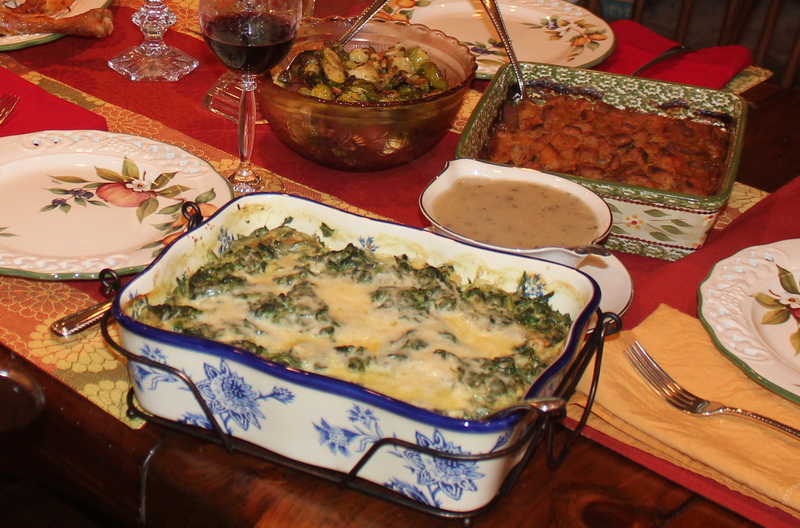 The first is Spinach Gratin, which my sister-in-law brought. It is from Ina Garten’s Barefoot Contessa Parties cookbook. She made a change to accommodate my food sensitivities (replacing the onions with garlic) and tweaked the recipe further for a little boost in nutrition (using whole wheat flour, lighter cream, and less salt). The ingredients and preparation follow. Preheat oven to 425. Melt butter over medium heat – add garlic. Add flour and nutmeg and stir for 2 minutes. Next add cream and milk – cook until thickened. After squeezing away liquid from defrosted spinach, add to pan. Put in 1/2 parmesan cheese in the mix, and season with salt and pepper. Put entire mixture into a baking dish, and add 1/2 cup parmesan and 1/2 cup Gruyere to top. Bake for 20 minutes. Delicious! 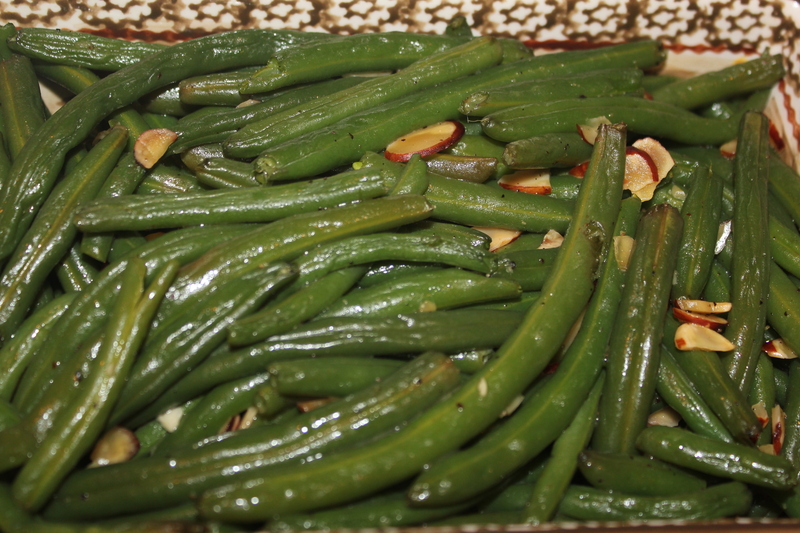 Cook green beans by either steaming or covered in a small amount of boiling salted water until crisp-tender. Drain. Cook almonds in butter over low heat, stirring occasionally, until golden. Remove from heat and add juice. Pour over beans. Enjoy these great recipes; and here is to happy holiday meals together. Aim sharing this recipe with Simply Sugar and Gluten Free and Food Trip Friday.